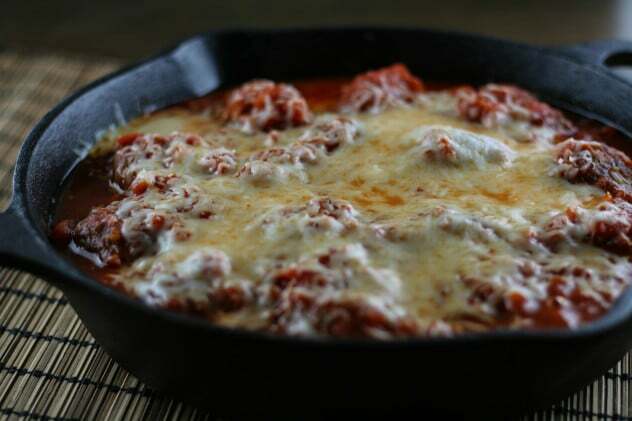 Italian food is a weekly staple in our house so of course I’m always on the lookout for healthy, Paleo-friendly Italian meals. I know, I know, how can you have Italian food without traditional pasta?? You can, I promise. 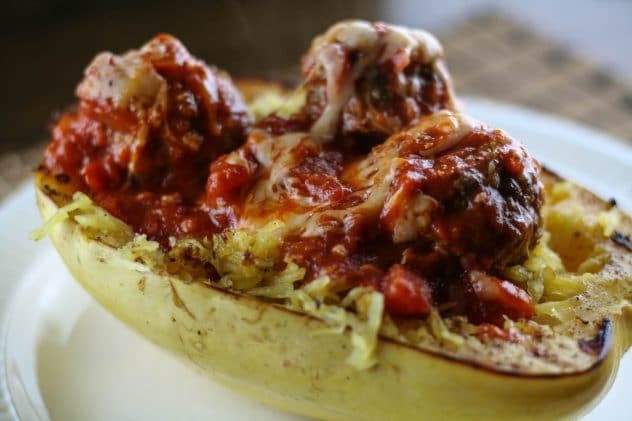 I’m not sure what took me so long to try out spaghetti squash but it is the best pasta alternative I have found. I’ve tried out several gluten-free pastas but you can’t beat the flavor of baked spaghetti squash coated in olive oil, Himalayan salt, and pepper. 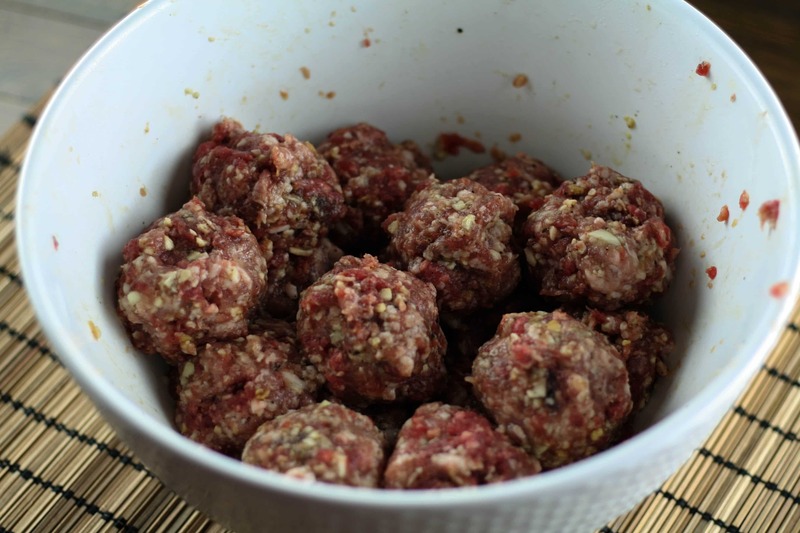 I mixed up these meatballs the night before to cut down on cooking time. Working all day with a long commute, on top of kids’ sports makes dinner time a challenge so I’m always looking for ways to cut down time. I decided to mix grass-fed beef with sweet Italian sausage, turned out to be the perfect combo. You guys have heard me mention my new found love with cast iron cooking. I baked these meatballs in my cast iron skillet then removed and topped with sauce and cooked a little longer. 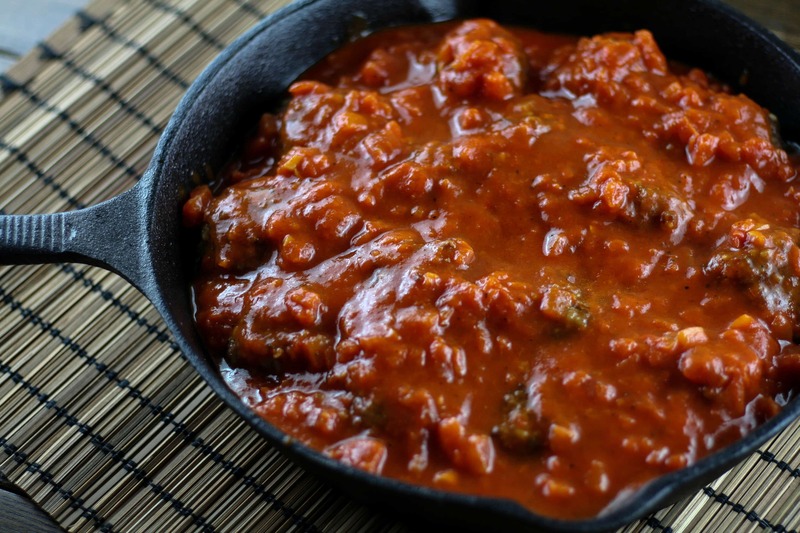 I did not use a homemade sauce recipe this time, however, this Spicy Heirloom Tomato sauce is what I used with this recipe and it is so good! I did sprinkle on some organic mozzarella cheese. Cheese is kinda iffy in the Paleo community but as I’ve mentioned before, on occasion won’t kill you. I didn’t snag a picture of my baking spaghetti squash, but it’s super simple. Cut your spaghetti squash in half, lengthwise. Brush with olive oil, and sprinkle with Himalayan salt and black pepper. Place face down onto a baking sheet and bake at 375F for 45 minutes. When finished baking, flip over and use a fork to scrape out the squash (your ‘noodles’). You can scrape out and serve on a plate or eat right out of the shell. Top with the meatball mixture and enjoy.